With the number of reviews I have done about travel guides for New York City, you would be forgiven for thinking that I am planning (in great detail) the trip of a lifetime. Unfortunately, that isn’t the case. Although I have experienced the excitement of the Big Apple, there isn’t another trip on the horizon – but that doesn’t stop me dreaming. For my next trip to NYC (written with purpose and a sense of forthrightness), my travel companion will be NYC Way, an iPhone and iPad app by MyCityWay. It is difficult to convey just how good this app is until you explore it for yourself. Essentially, it combines lots of really useful apps into one super-useful NYC app. It has everything from traffic updates and the Empire State Building’s lighting schedule to tourist attractions, show times, restaurants and street eats – you’ll never wander the city looking for a hotdog stand again! For parents, it is terrific to have practical information about where the nearest pharmacy or public toilet is but there is also a whole section devoted to kids – search child-friendly indoor and outdoor activities, tourist attractions, child-friendly restaurants and kids’ shops (M&M’s World on Broadway anyone?). The listings are as diverse as you can imagine – the Trapeze School New York, Hudson River Community Sailing, Central Park Carousel, BB King Blues Club, FDNY Fire Zone, FAO Schwarz and the lists go on and on. Each listing, under every category in this app is thorough – not only does it tell you how close things are, it also provides written directions (for those walking, riding or driving), a map, contact details and the option of saving the destination as a personal favourite, useful if you want to retrace your steps to the great little cafe you found three days ago. I don’t want to sound like an iPhone bore but this is the kind of app that makes me think “What did we do before iPhones? !” If I haven’t already sold, note that it is personally recommended by the Mayor of New York City, Michael Bloomberg. 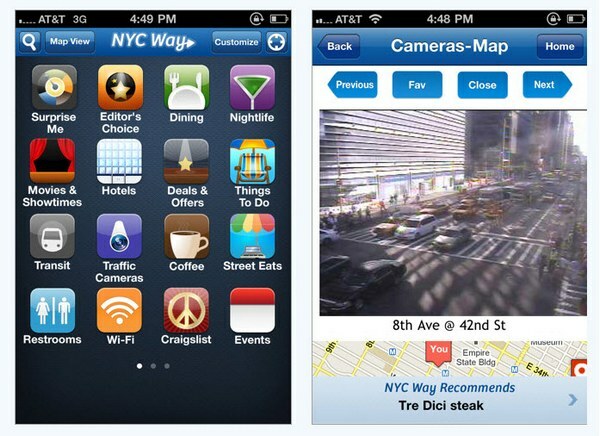 NYC Way is free and is available on iTunes. 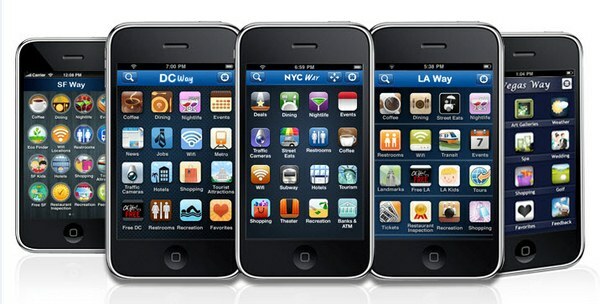 Also available are city guides for London, San Francisco, Washington DC, Las Vegas, Los Angeles, Chicago and many more. For city guides that are a little more ‘low-tech’ check some of our previous posts here and here.